1- No Title For Man United: Though the EPL is a marathon, evidence from their displays at home to Leicester City and in defeat at Brighton Hove, show there is a deeper malaise afflicting United than meets the eye. Pointer number one is the number of unfit players. Nearly all of United’s World Cup stars are 50-65 percent fit. 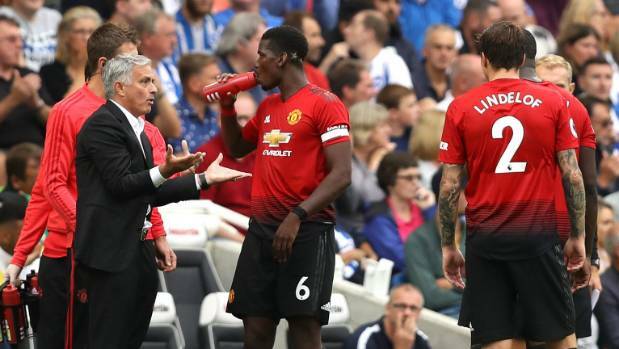 At Brighton, we didn’t see the best of Paul Pogba, Fred, Romelu Lukaku, Jesse Lindgard and Marcus Rashford because a player can’t give you his all unless he is fully fit. Contrast United’s stars with those of noisy neighbours Manchester City. In their opening day 2-0 victory at Arsenal, right back Kylie Walker and winger Raheem Sterling played with complete gusto, reaching unprecedented speeds and winning positions in many a pundits’ team of the week. My inference from the gaping disparity in fitness levels is either United players are unprofessional prima donnas who are incapable of self-motivation, or they are on a go-slow strike against boss Jose Mourinho. For United were pathetic. 2- Huddersfield Town, Cardiff City going down: David Wagner’s Terriers have been the EPL’s poorest team this August. Wagner is a football romantic but he must come to terms with the limitations of his squad but adopt an obdurate, determined approach. Huddersfield Town is incapable of aesthetics. A minus 8 goal difference is an alarming indicator for a team that last season survived relegation despite failing to score in 21 consecutive games. In gaining promotion, Cardiff City won many admirers with their direct, no holds barred determination. However, they are a team built for the Championship. Manager Neil Warnock boasts an enviable record winning promotions but once in the Premier League, his vision is as good as that of a rabbit caught up in bright lights. Cardiff was lucky not to lose all three points against ten-man Newcastle United. Warnock’s shortcomings are highlighted by his decision to recruit almost exclusively from the Championship. Harry Arter is the only signing who is at ease with the division. 3- Steep Learning Curve For Emery, Sarri: Chelsea’s 3-2 victory over Arsenal only served to emphasize the gulf between the two sides and champions Manchester City. Both managers are proponents of the full pitch press but their players haven’t fully appreciated how to execute it. This led to overexposure in a very open first half which could have ended 5-5. It was only after the introduction of Mateo Kovacic and Eden Hazard on 60 minutes that Sarri’s West Londoners asserted full control. That came from better protection of the ball from Kovacic, whose 43-ball, 100 percent pass completion rate was a game changer. For these teams to effectively challenge for honours, pressing with intelligence and protection for back four will have to be a hallmark of their game. 4- Burnley’s Euro Challenge: The strain of playing in the Europa League was apparent as Burnley fell 1-3 to Watford at Turf Moor. Sean Dyce’s hard battlers needed extra time to dispose of Istanbul Basakeshir and Aberdeen. Thus, this early in the season, a team with a small squad is stretched to the limit. With England goalkeepers Tom Heaton and Alexander Pope sidelined, Burnley are just two or three injuries away from getting sucked into a relegation dogfight. 5- Fulham Staying Up: Slavisa Jokanovic’s West Londoners are yet to register points on board. However, their fans needn’t worry. With their sleek passing and penetration, the newly promoted outfit was for long periods the better side in Saturday’s 1-3 reverse to Tottenham Hotspur. African imports Jean Michael Serri and Anguisa, together with Ryan Sessegnon and Alexander Mitrovic will give opposition sides a headache aplenty. Fulham has enough skill to stay in the division.